Initial public offering (IPO) or stock market launch is a type of public offering in which shares of a company are sold to institutional investors and usually also retail (individual) investors; an IPO is underwritten by one or more investment banks, who also arrange for the shares to be listed on one or more stock exchanges. Through this process, colloquially known as floating, or going public, a privately held company is transformed into a public company. Initial public offerings can be used: to raise new equity capital for the company concerned; to monetize the investments of private shareholders such as company founders or private equity investors; and to enable easy trading of existing holdings or future capital raising by becoming publicly traded enterprises. After the IPO, shares traded freely in the open market are known as the free float. Stock exchanges stipulate a minimum free float both in absolute terms (the total value as determined by the share price multiplied by the number of shares sold to the public) and as a proportion of the total share capital (i.e., the number of shares sold to the public divided by the total shares outstanding). Although IPO offers many benefits, there are also significant costs involved, chiefly those associated with the process such as banking and legal fees, and the ongoing requirement to disclose important and sometimes sensitive information. Details of the proposed offering are disclosed to potential purchasers in the form of a lengthy document known as a prospectus. Most companies undertake an IPO with the assistance of an investment banking firm acting in the capacity of an underwriter. Underwriters provide several services, including help with correctly assessing the value of shares (share price) and establishing a public market for shares (initial sale). Alternative methods such as the Dutch auction have also been explored and applied for several IPOs. Courtyard of the Amsterdam Stock Exchange (Beurs van Hendrick de Keyser [nl]) by Emanuel de Witte, 1653. Modern-day IPOs have their roots in the 17th-century Dutch Republic, the birthplace of the world's first formally listed public company, first formal stock exchange and market. The Dutch East India Company (also known by the abbreviation “VOC” in Dutch), the first formally listed public company in history, In 1602 the VOC undertook the world's first recorded IPO, in its modern sense. "Going public" enabled the company to raise the vast sum of 6.5 million guilders. The earliest form of a company which issued public shares was the case of the publicani during the Roman Republic. Like modern joint-stock companies, the publicani were legal bodies independent of their members whose ownership was divided into shares, or partes. There is evidence that these shares were sold to public investors and traded in a type of over-the-counter market in the Forum, near the Temple of Castor and Pollux. The shares fluctuated in value, encouraging the activity of speculators, or quaestors. Mere evidence remains of the prices for which partes were sold, the nature of initial public offerings, or a description of stock market behavior. Publicani lost favor with the fall of the Republic and the rise of the Empire. In the early modern period, the Dutch were financial innovators who helped lay the foundations of modern financial systems. The first modern IPO occurred in March 1602 when the Dutch East India Company offered shares of the company to the public in order to raise capital. 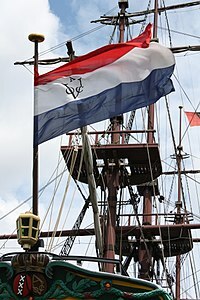 The Dutch East India Company (VOC) became the first company in history to issue bonds and shares of stock to the general public. In other words, the VOC was officially the first publicly traded company, because it was the first company to be ever actually listed on an official stock exchange. While the Italian city-states produced the first transferable government bonds, they did not develop the other ingredient necessary to produce a fully fledged capital market: corporate shareholders. As Edward Stringham (2015) notes, "companies with transferable shares date back to classical Rome, but these were usually not enduring endeavors and no considerable secondary market existed (Neal, 1997, p. 61)." In the United States, the first IPO was the public offering of Bank of North America around 1783. When a company lists its securities on a public exchange, the money paid by the investing public for the newly-issued shares goes directly to the company (primary offering) as well as to any early private investors who opt to sell all or a portion of their holdings (secondary offerings) as part of the larger IPO. An IPO, therefore, allows a company to tap into a wide pool of potential investors to provide itself with capital for future growth, repayment of debt, or working capital. A company selling common shares is never required to repay the capital to its public investors. Those investors must endure the unpredictable nature of the open market to price and trade their shares. After the IPO, when shares are traded freely in the open market, money passes between public investors. For early private investors who choose to sell shares as part of the IPO process, the IPO represents an opportunity to monetize their investment. After the IPO, once shares are traded in the open market, investors holding large blocks of shares can either sell those shares piecemeal in the open market or sell a large block of shares directly to the public, at a fixed price, through a secondary market offering. This type of offering is not dilutive since no new shares are being created. Because of the wide array of legal requirements and because it is an expensive process, IPOs also typically involve one or more law firms with major practices in securities law, such as the Magic Circle firms of London and the white-shoe firms of New York City. Financial historians Richard Sylla and Robert E. Wright have shown that before 1860 most early U.S. corporations sold shares in themselves directly to the public without the aid of intermediaries like investment banks. The direct public offering or DPO, as they term it, was not done by auction but rather at a share price set by the issuing corporation. In this sense, it is the same as the fixed price public offers that were the traditional IPO method in most non-US countries in the early 1990s. The DPO eliminated the agency problem associated with offerings intermediated by investment banks. The issuer usually allows the underwriters an option to increase the size of the offering by up to 15% under a specific circumstance known as the greenshoe or overallotment option. This option is always exercised when the offering is considered a "hot" issue, by virtue of being oversubscribed. Historically, many IPOs have been underpriced. The effect of underpricing an IPO is to generate additional interest in the stock when it first becomes publicly traded. Flipping, or quickly selling shares for a profit, can lead to significant gains for investors who were allocated shares of the IPO at the offering price. However, underpricing an IPO results in lost potential capital for the issuer. One extreme example is theglobe.com IPO which helped fuel the IPO "mania" of the late 1990s internet era. Underwritten by Bear Stearns on 13 November 1998, the IPO was priced at $9 per share. The share price quickly increased 1,000% on the opening day of trading, to a high of $97. Selling pressure from institutional flipping eventually drove the stock back down, and it closed the day at $63. Although the company did raise about $30 million from the offering, it is estimated that with the level of demand for the offering and the volume of trading that took place they might have left upwards of $200 million on the table. Underwriters, therefore, take many factors into consideration when pricing an IPO, and attempt to reach an offering price that is low enough to stimulate interest in the stock but high enough to raise an adequate amount of capital for the company. When pricing an IPO, underwriters use a variety of key performance indicators and non-GAAP measures. The process of determining an optimal price usually involves the underwriters ("syndicate") arranging share purchase commitments from leading institutional investors. The Government of Saudi Arabia is considering IPO of Saudi Aramco and selling around 5% of them. The IPO has been predicted by Forbes to have a price of $100 billion. Prior to 2009, the United States was the leading issuer of IPOs in terms of total value. Since that time, however, China (Shanghai, Shenzhen and Hong Kong) has been the leading issuer, raising $73 billion (almost double the amount of money raised on the New York Stock Exchange and NASDAQ combined) up to the end of November 2011. The Hong Kong Stock Exchange raised $30.9 billion in 2011 as the top course for the third year in a row, while New York raised $30.7 billion. Indian Stock Markets are also emerging as a leading IPO market in the world. As many as 153 initial public offers hit the Indian stock market in 2017 and raised USD 11.6 billion. ^ Kaiser, Kevin; Young, S. David (2013): The Blue Line Imperative: What Managing for Value Really Means. (Jossey-Bass, 2013, ISBN 978-1118510889), p. 26. As Kevin Kaiser & David Young (2013) explained, "There are other claimants to the title of first public company, including a twelfth-century water mill in France and a thirteenth-century company intended to control the English wool trade, Staple of London. Its shares, however, and the manner in which those shares were traded, did not truly allow public ownership by anyone who happened to be able to afford a share. The arrival of VOC shares was therefore momentous, because as Fernand Braudel pointed out, it opened up the ownership of companies and the ideas they generated, beyond the ranks of the aristocracy and the very rich, so that everyone could finally participate in the speculative freedom of transactions." ^ "Books & Reading: Chapter One". Retrieved 27 November 2016. ^ "Exhibits — America's First IPO — Museum of American Finance". Moaf.org. Retrieved 12 July 2012. ^ Rose Selden, Shannon; Goodman, Mark. "The Shift in Litigation Risks When U.S. Companies Go Public". Transaction Advisors. ISSN 2329-9134. ^ "The Laws That Govern the Securities Industry". Securities and Exchange Commission. Retrieved 12 December 2014. ^ "UK Listing Authority". Retrieved 12 December 2014. ^ Series 79 Investment Banking Representative Qualification Examination, Study Manual, 41st Edition. Securities Trading Corporation. 2010. ^ Robert E. Wright, "Reforming the U.S. IPO Market: Lessons from History and Theory", Accounting, Business, and Financial History (November 2002), 419–437. ^ Robert E. Wright and Richard Sylla, "Corporate Governance and Stockholder/Stakeholder Activism in the United States, 1790–1860: New Data and Perspectives". In Jonathan Koppell (ed. ), Origins of Shareholder Advocacy (New York: Palgrave McMillan, 2011), 231–51. ^ "Registration Statement on Form S-1". www.sec.gov. Retrieved 2017-12-10. ^ "The Main Players In An Initial Public Offering". 26 February 2012. Retrieved 22 July 2014. ^ "Ten of Nation's Top Investment Firms Settle Enforcement Actions Involving Conflict of Interest". 28 April 2003. Retrieved 23 July 2014. ^ Gould, Michael. "How Non-GAAP Measures Can Impact Your IPO". Transaction Advisors. ISSN 2329-9134. ^ Demos, Telis. (21 June 2012) What Is a Dutch Auction? – Deal Journal – WSJ. Blogs.wsj.com. Retrieved on 2012-10-16. ^ Hasen, Richard L. (12 October 2012) What Is a Dutch Auction IPO? – Slate Magazine. Slate.com. Retrieved on 2012-10-16. ^ Sommer, Jeff (18 February 2012). "An I.P.O. Process That Is Customer-Friendly". The New York Times. ^ "Journal of Business & Technology Law - Academic Journals - University of Maryland Francis King Carey School of Law" (PDF). Retrieved 27 November 2016. ^ Hensel, Nayantara. (4 November 2005) Are Dutch Auctions Right for Your IPO? – HBS Working Knowledge. Hbswk.hbs.edu. Retrieved on 2012-10-16. ^ WhiteGlove seeks to raise $32.5 million in 'Dutch auction' IPO. www.statesman.com. Retrieved on 16 October 2012. ^ Cowan, Lynn. (21 September 2011) WhiteGlove Health Shelves IPO Indefinitely – WSJ.com. Online.wsj.com. Retrieved on 2012-10-16. ^ "Alibaba IPO Biggest in History as Bankers Exercise 'Green Shoe' Option". The New York Times. 18 September 2013. ^ "Softbank Corp IPO Second Biggest in History". Fortune.com. 11 December 2018. ^ "Agricultural Bank of China Sets IPO Record as Size Raised to $22.1 Billion". Bloomberg. 15 August 2010. ^ "ICBC completed its record $21.9 billion IPO in October 2006". Bloomberg. 28 July 2010. ^ "AIA's IPO Boosted to $20.5 Billion With Overallotment". Bloomberg. 29 October 2010. ^ a b c Grocer, Stephen (17 November 2010). "How GM's IPO Stacks Up Against the Biggest IPOs on Record". Wall Street Journal. ^ "Saudi Arabia is considering an IPO of Aramco, probably the world's most valuable company". The Economist. 7 January 2016. Retrieved 23 May 2016. ^ Wald, Ellen R. "The World's Biggest IPO Is Coming: What You Should Know About Aramco". Forbes. ^ "China eclipses US as top IPO venue". 28 December 2011. Gregoriou, Greg (2006). Initial Public Offerings (IPOs). Butterworth-Heineman, an imprint of Elsevier. ISBN 978-0-7506-7975-6. Bradley, D. J.; Jordan, B. D.; Ritter, J. R. (2003). "The Quiet Period Goes Out with a Bang". Journal of Finance. 58 (1): 1–36. CiteSeerX 10.1.1.535.3111. doi:10.1111/1540-6261.00517. Goergen, M.; Khurshed, A.; Mudambi, R. (2006). "The Strategy of Going Public: How UK Firms Choose Their Listing Contracts". Journal of Business Finance and Accounting. 33 (1&2): 306–328. doi:10.1111/j.1468-5957.2006.00657.x. SSRN 886408. Anderlini, Jamil (13 August 2010). "AgBank IPO officially the world's biggest". Financial Times. Retrieved 13 August 2010. "Quiet Period". Securities and Exchange Commission. 18 August 2005. Retrieved 4 March 2008. The federal securities laws do not define the term "quiet period", which is also referred to as the "waiting period". However, historically, a quiet period extended from the time a company files a registration statement with the SEC until SEC staff declared the registration statement "effective". During that period, the federal securities laws limited what information a company and related parties can release to the public.